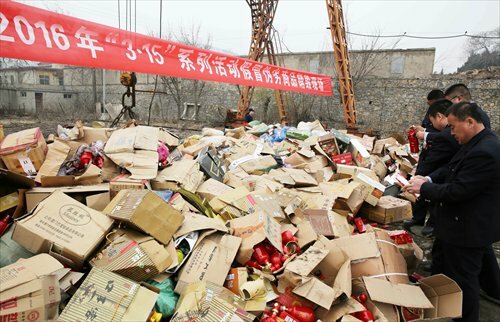 The government will intensify its efforts to monitor goods sold via online retail, as the sector has drawn the most complaints since 2014, Beijing-based Legal Mirror newspaper reported Tuesday, citing an official. Yang Hongcan, an official in charge of consumer rights protection with the State Administration for Industry and Commerce (SAIC), was quoted as saying that the SAIC handled 6,737 legal cases in regulating online retail in 2015. Tuesday was also the World Consumer Rights Day. A report released by the China Consumers Association (CCA) on March 4 revealed data for complaints about goods and services in China in 2015. The number of complaints over fake goods reached 5,234 in 2015, accounting for just 0.82 percent of the total complaints. Quality problems were the main issue, accounting for 44.56 percent of complaints in 2015, while 21.2 percent of complaints related to after-sales service and 1.52 percent to fake promotion, said the CCA, which processed a total of 639,324 complaints in 2015. Also, the CCA processed 20,083 complaints about goods bought via delivery in 2015, over 95 percent of which are bought via online retail. However, despite the relatively small number of complaints over fake products, the issue is still taken seriously, both due to its persistence and its damage to intellectual property rights, experts said. Experts said big data technology could be an effective way of cracking down on sales of counterfeit goods online and offline, and they called for deeper cooperation between authorities and e-commerce platforms. Alibaba Group, which claims to have a share of more than 60 percent of China's e-commerce market, has pledged more efforts to eradicate fake goods from its Tmall and Taobao platforms, according to a statement the company sent to the Global Times on Monday. In 2015, Alibaba provided thousands of leads for law enforcement authorities, and assisted the police in the arrests of over 700 people engaged in making or selling fake goods worth over 3 billion yuan ($460 million), Jack Ma Yun, chairman of Alibaba, said at a company meeting held recently, the statement said. The company also mobilized a 300-strong team to tackle counterfeit goods in December 2015. "Driving these people away from Alibaba is only half a success. We should also make sure that those who sell fake goods cannot move to other online stores," Ma was quoted as saying by the statement. The lack of a mature mechanism to protect intellectual property rights and consumers' interests is a major reason why it is so hard to crack down on sales of fake goods both online and offline, experts said. "Given that costs of litigation can reach thousands of yuan, Chinese consumers are usually unwilling to file lawsuits against counterfeit good sales," Zhao Zhanling, a legal counsel with the Internet Society of China, told the Global Times Tuesday. "I kind of know what will happen when I pay 10 yuan for an iPhone charger: It will go up in smoke one day," a consumer, who declined to be named, told the Global Times Tuesday, noting that he wouldn't bother filing complaints about a fake product that only cost 10 yuan, when the authentic product costs about 150 yuan. Things are expected to improve, Zhao noted, as China has issued various new rules to protect consumers' rights since 2014, such as allowing provincial-level consumer associations to file public interest litigation on behalf of individual consumers. "With efficient enforcement, public interest litigation, similar to US class action lawsuits, can be a powerful legal tool in protecting consumers' interests. It could lower the litigation costs for individuals and also lead to bigger punishment for sellers and producers of counterfeit goods," he noted. Inadequate supervision also should be blamed, Guo Shaofen, chief economic analyst with the China International Electronic Commerce Center, told the Global Times Tuesday. "The authorities mainly rely on victims' complaints to crack down on counterfeiting, but they should take a more active role," said Zhao. Chinese consumers' awareness about the need to protect intellectual property rights should also be enhanced. "When the buying [of fake goods] stops, counterfeiting will stop too," said Zhao. Ala Musi, director of the policy and law committee of the Beijing-based China E-commerce Association, said goods are sometimes incorrectly categorized as being fake. Goods that "lack instructions or trademarks can easily be labeled as fake goods. This often happens with cheap but good quality agricultural products and handcrafts," he told the Global Times Tuesday.